Uninterrupted power supply with generator facility thru 125 KVA in Boys Hostel and an exclusive 82.5 KVA power generator for the Women's Hostel. Spacious rooms with sufficient lighting, fan and furniture facility. Residential tutors stay with the students. Special coaching is given for slow learners. Telecommunication through landline and intercom. 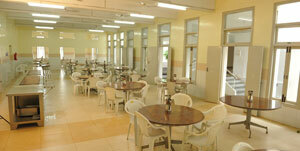 Nutritious food served in two dining halls with a combined capacity of 400 in the Boys Hostel and 250 in the Ladies Hostel. Automated modern kitchen with steam Boilers, Cold room, Automatic Chapatti maker, Automatic Dosa Maker, Vegetable cutter, Deep freezer, Flour kneader, Tilting grinders and Dish washers etc. Safe drinking water through water purifiers. Four × 1000 Litres per day solar water heaters for bathing purpose in both the Hostels.